If you are trying to eat healthier, adding more fiber to your diet is a good place to start. These moist and flavorful Blueberry Bran Muffins do this, as they contain whole wheat flour and bran. This excellent recipe is one I adapted from Bonnie Stern's excellent cookbook "More Heart Smart Cooking with Bonnie Stern" which is written in conjunction with the Heart and Stroke Foundation of Canada. Although we could use just whole wheat flour in these Blueberry Bran Muffins, this recipe combines whole wheat with all purpose flour, which gives the muffins a lighter texture with more rise than if we had used just whole wheat flour. These bran muffins also differ from most in that we are using unprocessed wheat bran instead of a commercially made bran cereal. You will find that unprocessed wheat bran is cheaper than commercial bran cereals and it is now readily available in most grocery stores (often in the organic food section) or else in health food stores. If you are not familiar with buttermilk it has a thick creamy texture with a rich tangy buttery taste that makes baked goods tender. You can make a good substitute for commerical buttermilk. Stir 1 tablespoon of white distilled vinegar, cider vinegar, or lemon juice into 1 cup (240 ml) of whole or reduced fat milk. Let stand at room temperature for about 10 minutes before using. Another option is to use buttermilk powder which can be found in some grocery stores or in specialty food stores. Normally, when you bite into a bran muffin you find raisins. While you can still use raisins or other dried fruits, for a change we are adding blueberries. Blueberries are what we now call a 'super' food. Leanne Kitchen in "The Produce Bible" tells us these sweet deep indigo blue berries contain "cholesterol lowering compounds, antioxidants, Vitamin C, potassium, folate, and dietary fiber. In this recipe you can use either fresh or frozen blueberries. If using frozen, do not thaw before adding them to the batter. Fold the blueberries gently into the batter so they do not crush and end up staining the whole batter blue. 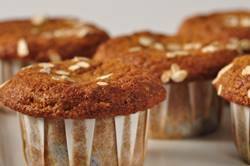 Blueberry Bran Muffins: Preheat your oven to 375 degrees F (190 degrees C). Line a 12 cup muffin pan with paper liners or else oil or spray the muffin cups with a nonstick vegetable spray. In another bowl whisk the egg white until frothy. Then add the molasses, vanilla extract, oil, and buttermilk and whisk to combine. Evenly fill the muffin cups with batter, using two spoons or an ice cream scoop. If you like, sprinkle the tops of the muffins with a few flakes of rolled oats. Bake for about 18 minutes or until a toothpick inserted into the center of a muffin comes out clean. Remove from oven and place on a wire rack to cool slightly before serving.